Skewers, soaked for an hour or so. To Make the Shrimp: Preheat the oven to 400 degrees F. To a bowl, add the shrimp, along with the lime juice, chipotle chile pepper, garlic powder, cumin, ground cayenne and salt. Mix until the shrimp are completely coated. 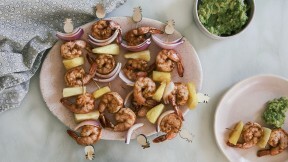 To skewers, alternating, add the shrimp, pineapple and red onion. Transfer to a baking sheet. Alternatively, you can cook these over a high flame on the grill. If you do it this way, you’ll have to cook the shrimp for about 2 to 3 minutes on each side. Transfer the oven to cook for about 15 minutes, rotating them at the 7 minute mark. To Make the Guacamole: To a small bowl, smash together the avocado, red onion, lime juice and a few pinches of salt. Serve the shrimp with the guacamole on the side for dipping!